Make this the day before, you're welcome! In a measuring cup, combine water, olive oil and molasses. TIP: Measure out the olive oil first and then the molasses. That way the molasses won’t stick to the spoon. Mix flour, salt and instant yeast together. Make a well in the middle of the flour mixture and slowly pour the water mixture into it. Using the paddle attachment, run mixer on low to bring all the ingredients together (should take about 30 secs to 1 minute). Switch to the hook attachment and run mixer on medium for about 15 minutes. Your dough ball should be slightly tacky but not sticky. Form dough into a ball and place in a lightly greased bowl. Cover loosely with plastic wrap and place it in the refrigerator overnight to rise. Or you can let it rise on the counter top for 2 hours. Preheat oven to 500°F with your pizza stone inside on the very bottom shelf. Once your oven reaches 500°F, you need to preheat the stone for another 30 minutes before placing your pizza in the oven. After your dough has rested for 30 minutes, you can start to form it into your pizza crust. I like to form my dough on parchment paper sprinkled with cornmeal. Again, Alton Brown has a great demo on this and can explain it a lot better than I could. Brush whole pizza with olive oil and top as desired. Place it in the oven for about 7-9 minutes or until the crust is a nice golden brown. 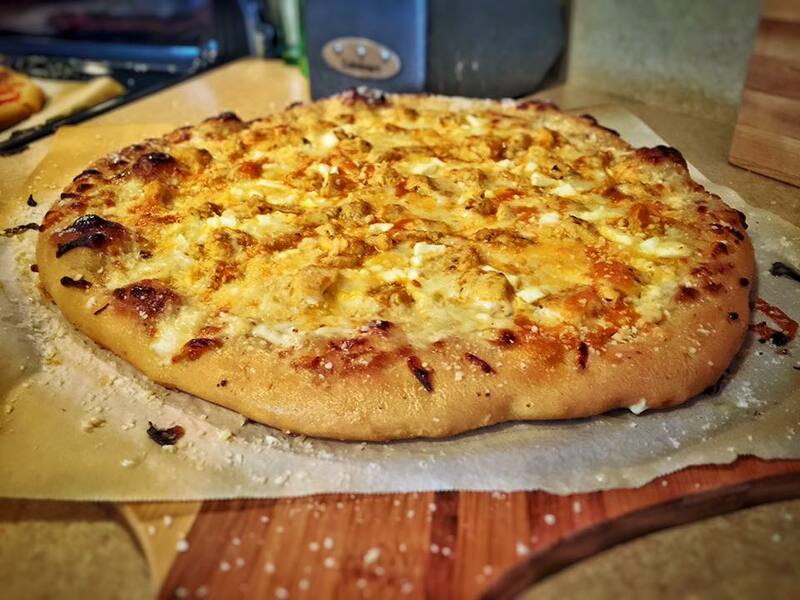 Remove pizza from oven and brush crust with melted garlic butter immediately. Then sprinkle with parmesan cheese. Cut and serve. 15 ounces = (1) 14 inch pizza <=== this recipes will yield 2 of these.